The Middle Fork of the Vermilion River, Illinois’ only National Scenic River, is on America’s Most Endangered Rivers list of 2018 thanks to leaking coal ash ponds- take action today! Photo by Jeff Lucas, Gutting the Heartland. 2014. 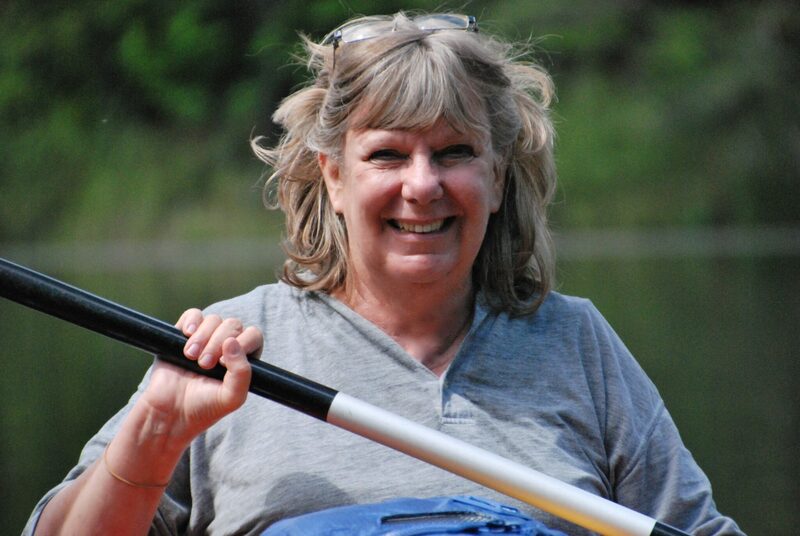 The following guest blog from Pam Richart with Eco-Justice Collaborative is part of our America’s Most Endangered Rivers® series on the Middle Fork of the Vermilion River in Illinois. It first appeared on American Rivers website on May 21, 2018. The first major battle for the Middle Fork of the Vermilion River in its over 10,000-year history occurred in the early 1970s, when farmhouses were purchased and razed, and construction equipment moved in to dam the river for recreational purposes. Due to the hard work of tens of thousands of people who wrote letters, made calls, and met with their elected officials, the dam was stopped. Then in 1986, the Middle Fork of the Vermilion was designated a State Scenic River. Three years later, the U. S. Department of Interior designated 17.1 miles of the Middle Fork of the Vermilion as a National Scenic River. At the time, with a state-administered corridor management plan in place, people thought the river would be protected from future threats. This year, as we celebrate the 50th Anniversary of the Wild and Scenic Rivers Act, the Middle Fork of the Vermilion is again under siege. This time, the river is threatened by a plan that could leave 3.3 million cubic yards of coal ash in its floodplain forever. The coal ash is stored in three unlined pits, just a few yards from the river channel. Two of the three pits are known to be leaking, and the erosion of the banks next to these impoundments continues to raise concerns over a possible breach and coal ash spill. East-central Illinois boasts some of the richest farmland in the country. However, the predictable “flat-as-a-pancake” topography abruptly changes when approaching the Middle Fork of the Vermilion River from the west. This scenic river carves a meandering path through Illinois’ Grand Prairie glacial deposits, exposing scenic, steep, valley slopes with towering bluffs. Most of the area along the Middle Fork is forested (including stately oaks, beech, and sugar maple), but there are also several prairie sites and seep springs. Giant sycamore trees with their twisted, exposed roots line the riverbanks providing shade during summer months, and the variety of hardwood species in upland and bottomland forests present a firestorm of fall color. The only structures visible from the river are the abandoned power plant and its smokestack and pump house located further downstream. The scenic river designation begins at the northern boundary of the Middle Fork State Fish & Wildlife Area and extends through Kennekuk County Park, power plant property, and on through Kickapoo State Park. The river and its 1,000-foot wide scenic corridor pass through nearly 10,000 acres of public lands. The only private property is the land owned by Dynegy, where the Vermilion Power Generating Station and associated coal ash pits are located. The Middle Fork is an upper perennial stream, which is uncommon in central Illinois. The average gradient is 2.9 feet per mile and it twists and turns through boulder riffles, making it fun to paddle. This clear, gravel-bottomed river is one of the highest quality and most biologically diverse in Illinois. Numerous species of fish, mussels, and other invertebrates live in its fast-moving water, sand and gravel raceways, and clear pools. Good populations of game fish such as smallmouth bass, crappie and channel catfish are present. Perhaps the most notable among the abundant and diverse fish fauna is the bluebreast darter. The breeding male has a colorful olive-green body with a bright blue breast, orange dorsal fins, and red spots along the sides. The only known location of this species in Illinois is in the Vermillion River basin. Wildlife is abundant. Woodlands provide habitats for many mammals, including the grey fox, fox squirrel, raccoon, and white-tailed deer. The least shrew, red fox and striped skunk make their home in the transitional grassland/shrub areas. River otter, mink, beaver, and muskrat inhabit river shorelines. Wood ducks, egrets, heron, kingfisher, and shorebirds make their home in the bottomlands. 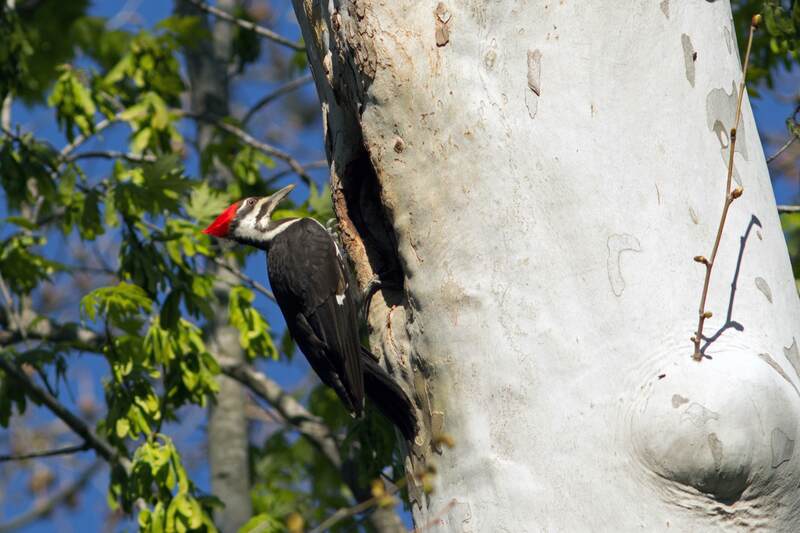 The upland wooded areas are frequented by warblers, vireos, and most common songbirds, and it is not uncommon to see a pileated woodpecker. Several pairs of nesting bald eagles have made their home along the river’s edge, and the elusive southeastern shrew also is found in the area. In spring, the woods explode with a vibrant display of colorful wildflowers, including Jack-in-the-pulpits, violets, bluebells, sweet Williams, spring beauties, Dutchman’s-breeches, wake-robins, and nodding trilliums. A 1,000-year-old, native American complex listed on the National Register of Historic Places sits along the bluffs and in the floodplain of the Middle Fork on the east side of the river, in Kennekuk County Park. This is a ceremonial site that is believed to have connections to the Cahokia Mounds State Historic Site, a 2,000-acre complex of mounds where a pre-Columbian city thrived at the confluence of the Missouri and Mississippi rivers. Named after the Collins family that farmed the area, the complex features eight mounds that exhibit lunar alignment. The most prominent – Indian Springs Mound – is about 7 feet tall, sits on a bluff overlooking the river, and was built over a wooden, burned funeral structure that contains the remains of indigenous leaders. What connects Collins to Cahokia are the mounds themselves, their shape and placement, and the artifacts found there. kayaking, tubing, wildlife viewing, photography, hunting, angling, hiking, and horseback riding. A livery located in Kickapoo State Park puts over 10,000 people on the Middle Fork River in canoes, kayaks and tubes each year. Later this year, the Illinois EPA is likely to decide on a proposal by Vistra Energy/Dynegy (Dynegy) that could leave 3.3 million cubic yards of coal ash in unlined, leaking pits on the banks of the Middle Fork, where erosion from this natural meandering river threatens their long-term stability. Two of the three coal ash pits are known to be leaching arsenic, barium, boron, chromium, iron, lead, manganese, molybdenum, nickel, and sulfate into the river. These contaminants are known to cause birth defects, cancer and neurological damage in humans, and can harm and kill wildlife, especially fish. But perhaps most alarming is the ongoing erosion of riverbanks next to the two oldest pits. Gabions (wire baskets filled with rock) installed in the 1980’s to protect the pits from the meandering river have been severely compromised, leaving the river bank vulnerable to aggressive erosion. They have been ripped off the banks by the Middle Fork, and either lie in the channel next to the pits or have been swept downstream. 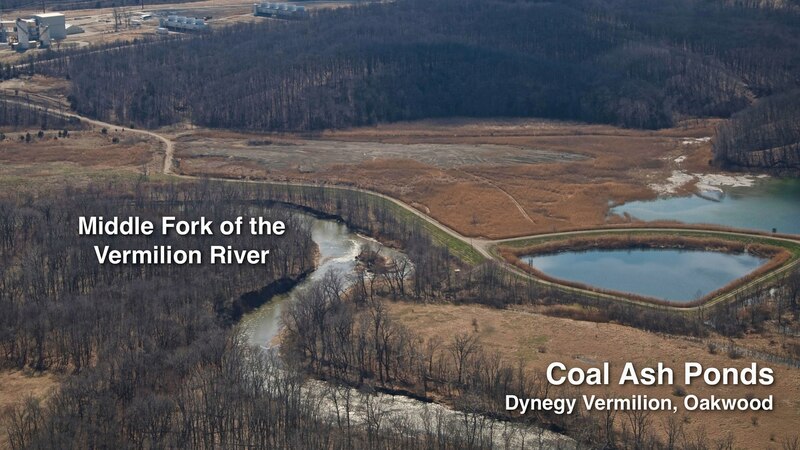 Two storms in 2015 were responsible for eroding banks precariously close to the New East Ash Pit, causing Dynegy to seek emergency riverbank stabilization to avoid a potential breach. 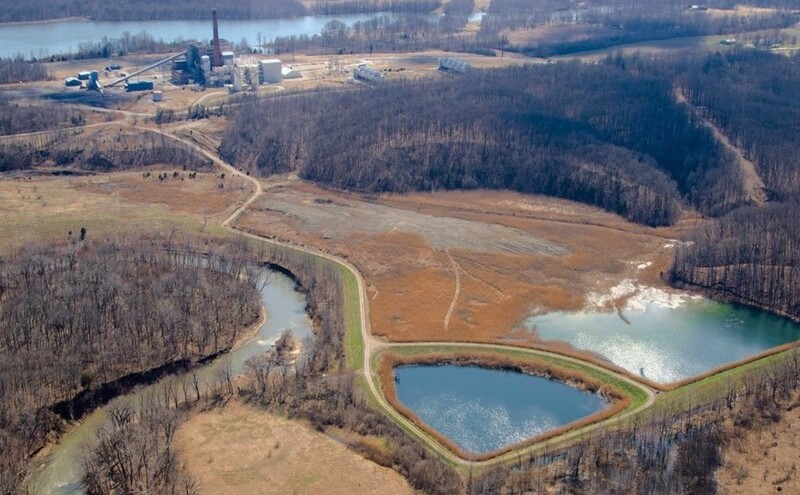 A recent engineering study by Dynegy’s consultant shows just 15 feet remains between the river bank and the toe of the slope of the coal ash pits in some areas along the North and Old East pits. A previous study indicated that the Old East and North Ash Pits could fail if separation between the bank and the toe of the slope of these pits is reduced to just eight and 10 feet, respectively. In the meantime, a near-record storm this past February appears to have further eroded the banks adjacent to these pits – severely undercutting banks and leaving large, cavernous holes from downed trees and boulders moved downstream by this flood event. 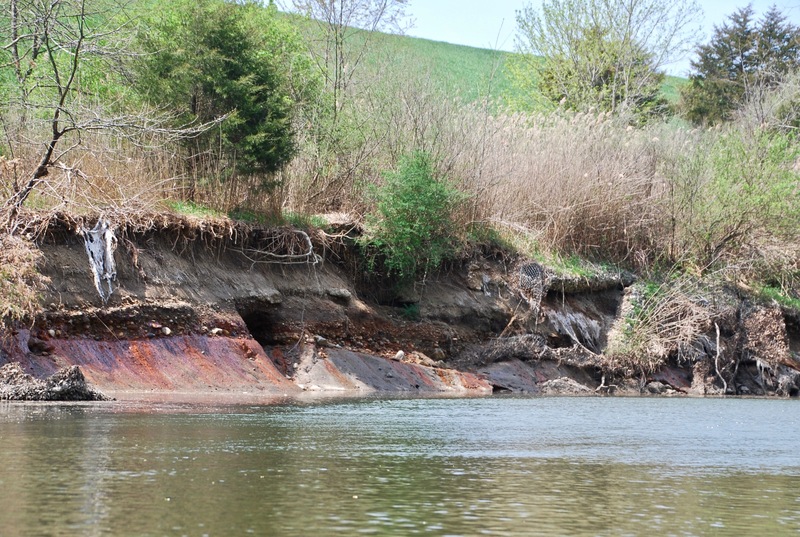 As the Middle Fork of the Vermilion River continues to wear away at the sides of riverbanks next to these pits, the threat of a catastrophic breach continues to increase. And while Dynegy’s plan includes bank stabilization, we know no stabilization lasts forever. 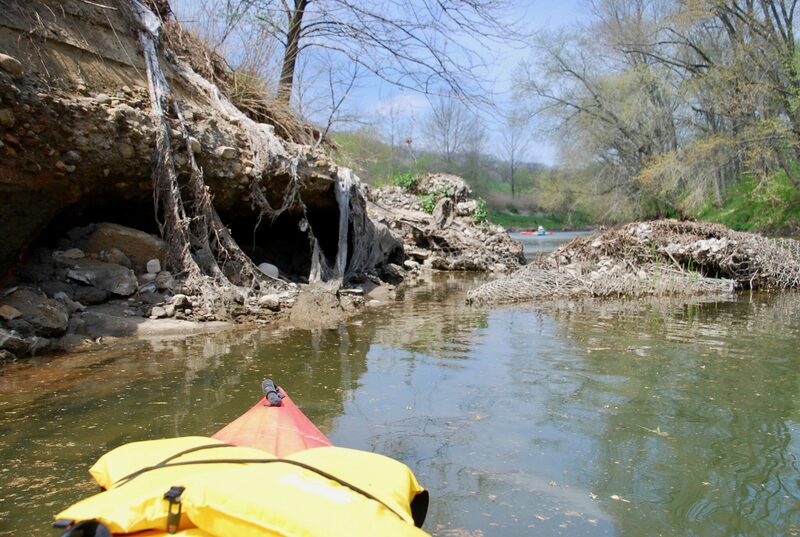 This is another time the public needs to demand the protection of Illinois’ only National Scenic River. There or no requirements for a public hearing on a proposal that could leave Vermilion County residents a legacy of toxic coal ash and, to date, the Illinois Environmental Protection Agency has declined to hold one. Any decision that is made by the Illinois EPA as to whether or not Dynegy will be able to cap and leave its coal ash in the river’s floodplain with bank stabilization will be made without any public input. That’s why Eco-Justice Collaborative is holding a People’s Hearing in Danville, Illinois, next month. The agency’s decision will either positively – or negatively – affect the health, recreational, scenic and economic values of this National Scenic River. This hearing will give those who rely on the river an opportunity to voice concerns that are backed up with facts by experts who will testify on the risks of leaving the ash in the river’s floodplain. Please send a letter to Governor Rauner and Illinois EPA Director Alec Messina asking them to ensure this toxic waste will be removed and relocated to a properly-constructed, lined, and monitored facility far from the Middle Fork. That is the only solution that can fully protect this National Scenic River from ongoing pollution or a potential coal ash spill. Pam is Co-Director of Eco-Justice Collaborative (EJC). EJC is organizing a grassroots campaign to remove the coal ash from the Middle Fork of the Vermilion River.